Two hospitals operated by Doctors Without Borders (Médecins Sans Frontières) will close their doors in Haiti's capital Port-au-Prince, the aid group announced. A big sign on the front gate reads: "We are no longer receiving patients, the hospital is closed." A 176-bed obstetrics hospital in the Delmas area of Port-au-Prince will close in the coming days after some final patients are discharged and a hospital in the Tabarre area will close next year. How did these hospital come into existence? Doctors without border opened these hospitals in the aftermath of the 2010 Haiti earthquakes. They were supposed to close soon after but were extended due to the medical needs in Haiti. We continue to respond to urgent needs wherever possible, but greater investment is required by the Haitian government and international donors to meet the growing demand. 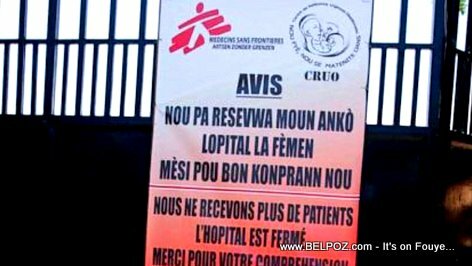 It's unfortunate; as such - the closing of the two Doctors Without Borders (DWB) Hospitals In Port-au-Prince. However, in the context of the Hegelian Dialectic and the DWB's following statement, "...greater investment is required by the Haitian government and international donors to meet the growing demand..."